Celebrate International Sangha Day in Your Community! How are you? I think this center is the best place on this earth for you only. For some Sangha, it is like being in hell. Just remember for great bodhisattvas, brave-hearted ones, hell is the best pure land because they can suffer for the numberless sentient beings, even just for one sentient being, and especially for hell beings. What a joyful, lucky, fortunate one you are. 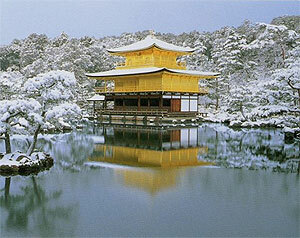 A postcard came with the note: This is your style temple in which to have a very quiet time, just deep sleep or Zen meditation, hear the birds’ noise. HA HA. You think this will happen. Yes, when you offer one mandala, this is a tiny result of just that one mandala offering, which has skies of offerings. You give yourself to those simple ordinary people who have problems. Guide meditation, chat to them as they need that happiness, and teach them, making your body, speech and mind theirs. You are like my limbs, part of my body, my representative, the embassy of FPMT. In another words, I want you to think this way. Please have long life. For me to fulfill my wishes, which are FPMT wishes, for the whole organization, students, for outside people, non-Buddhist, Buddhist, sentient beings. Colophon: Transcribed from a handwritten note by Lama Zopa Rinpoche on April 24, 2007. Lightly edited by Claire Isitt on June 22, 2010. We invite you to celebrate FPMT’s Eighth International Sangha Day on July 15, 2010 – Wheel Turning Day. From the early days of the FPMT, monks and nuns have served tirelessly to help bring the benefit of the Buddha’s teachings to the far corners of this planet. Today, the FPMT International Mahayana Institute (IMI) community has over 300 monks and nuns who continue to serve throughout the FPMT in many capacities: as teachers, retreat leaders, center directors, spiritual program coordinators, developers of educational curriculum, editors and counselors. The Sangha, by taking vows of renunciation, living in morality and having the space to focus on the Dharma, are an integral part of maintaining the existence of the Buddha’s teachings. It is for this reason that International Sangha Day is celebrated on First Turning of the Wheel of Dharma Day. This year, International Sangha Day is on Thursday, July 15. As one of the four main Buddhist special days, First Turning of the Wheel Dharma Day is a day where the karmic effects of actions performed are multiplied one hundred million times, making this a very auspicious day to raise awareness of and express gratitude for the Sangha Jewel. Rinpoche’s advice to Sangha has been collected by Lama Yeshe Wisdom Archive. The third year that Lama Zopa Rinpoche, Dagri Rinpoche and Khadro-la offered 100,000 Tsog Offerings to Padmasambhava in front of the Bouddhanath Stupa in Nepal. The puja took about five days and many of the monks and nuns from Kopan Monastery attended. 4,200 monks at Drepung Lachi Monastery in India offered Tukchuma puja (64 offerings to Kalarupa to eliminate obstacles for one’s activities or projects) as well as Namgyal Tsechog, performed to the Buddha Namgyälma to remove all obstacles for one’s life and to have a long life. This puja is specifically dedicated to His Holiness the Dalai Lama and for all beings that are benefiting others and practicing virtue. The 400 monks at Kopan Monastery in Nepal offered Tukchuma puja and Medicine Buddha puja. The 400 nuns at Khachoe Ghakyil Nunnery in Nepal offered 100,000 recitations of Praises to the 21 Taras. Offerings were made to all of Lama Zopa Rinpoche’s gurus and to IMI Sangha at the different international Sangha communities within FPMT. The second year that Lama Zopa Rinpoche arranged sponsorship for the 100 Million Mani Retreat by the Tashi Chime Gatsal Nuns, who are from a very remote and poor nunnery near the holy mountain of Lapchi, Nepal, where Milarepa did many retreats. The 100 Million Mani Retreat is done over three months and Rinpoche also arranged for a lama to give lam-rim teachings at the same time, so that the retreat would be more integrated. Last year, 53 nuns completed the retreat. FPMT wishes to express deep gratitude to Catherine Lau for her kind support in helping this project. 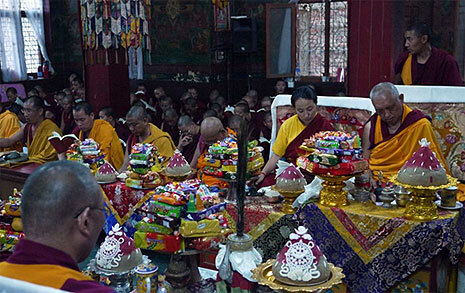 Lama Zopa Rinpoche, Khadro-la, Dagri Rinpoche during the 100,000 Tsog Offerings to Padmasambhava, June 2010. Check out the new videos of Lama Zopa Rinpoche on the FPMT website, including a video of the three-day long life puja which Khadro-la offered to Lama Zopa Rinpoche, and which was sponsored by Kopan Monastery. We can rejoice that at the puja, Ven. Roger Kunsang, on behalf of the entire FPMT organization, offered body, speech and mind with a money offering to Rinpoche, and also made offering to the lamas, Khadro-la and all the monks and nuns in attendance. You can always keep up to date with Rinpoche’s tireless activity around the world thanks to Ven. Roger Kunsang’s hugely enjoyable and awe-inspiring blog, Life on the Road with Lama Zopa Rinpoche. 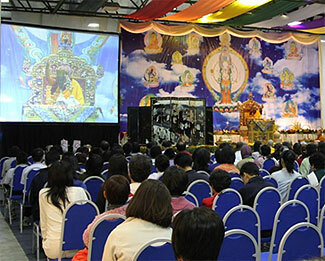 The recent Chenrezig initiation given by Rinpoche in Malaysia to between 2,000-3,000 people, June 2010. With translations now available in eleven languages, this year we’re pleased to introduce the International Merit Box Project. In 2010 we hope the project becomes truly international with an even more diverse array of countries represented and continued growth in under-represented regions. Help the International Merit Box Project benefit others even more by continuing your daily practice of generosity in 2010. If you wish to start your practice, information about the practice can be found online and you can always order your own free International Merit Box kit easily. It is truly an inspired, beneficial and simple way to make generosity a daily practice. Basic Program: A new Basic Program retreats web page will help BP students worldwide see where they can fulfill their BP retreat requirements. Several retreats in several regions have been added with hopefully more to come! Please let us know if you host a one-month or longer lam-rim retreat so we can add you to this list. Thus far, none are being hosted in the USA! NEW! Basic Program Homestudy package, Engaging in the Bodhisattva Deeds Part Two, Chapter VI-X. The package includes extensive and accessible teachings by Geshe Chonyi on both the “Patience” and the “Wisdom” chapters, a well-edited transcript (generously contributed by Amitabha Buddhist Centre), and guided meditations for practice and retreat. NEW! Taking the Essence: Practices to Make Every Moment of Life Meaningful. From the advice of Lama Zopa Rinpoche, this new practice booklet contains the vital elements for making daily life most meaningful. It includes a new bodhisattva attitude prayer translated by Rinpoche, mantras from sutra and tantra that empower your speech and bless your body, the Eight Mahayana Precepts ceremony, and bodhichitta mindfulness exercises to imbue every action with bodhichitta. Back in stock! The Liberation Box: Tools for a Fortunate Rebirth. This collection of tools for the time of death has been assembled according to Lama Zopa Rinpoche’s advice, and contains powerful methods for ensuring a fortunate rebirth for those who have died or are dying. The box has everything you need to assist others at the time of death: Recitations to Alleviate Pain and Recitations for the Time of Death on CD; various mantras for recitation; the Liberation Card for a Dying Person; a Kadampa stupa filled with the four dharmakaya relic mantras; a powa pill and blessing cord to be placed on the dying person’s crown; copies of mantras; and a complete text to be placed on the body, and the book, Heart Practices for Death and Dying. A good tip from Spain who has recently printed Essential Buddhist Prayers in Spanish: Do one printing on white paper for personal use and a second printing on colored paper for center use. This way it is very easy to identify a center copy, making it less likely for center copies to mistakenly be taken out of the gompa. One of the highlights of the recent European regional meeting was all the news and progress made on the translation front. Both Spain and France have new websites where centers can easily access FPMT education programs, practices, the FPMT Handbook, as well as a growing library of other FPMT materials. We’re very grateful to the translation coordinators Ven. Nerea and Ven. Detchen and all the others responsible for this great development. The effort to standardize English FPMT Dharma terminology is also making headway. A database has been created as a shared resource that translators can comment on and contribute to and which, over time, will become the source for FPMT terminology choices. A small FPMT translators conference is also being planned for May 2011. To date 100,000 people have accessed the DB videos in Spanish on YouTube! Mandala’s July/September 2010 issue, “Like Nectar on Flowers: The Selfless Service of FPMT-Registered Teachers” is the sixth in a series of seven issues dedicated to telling the story of FPMT. This addition to the series focuses on the many FPMT-registered teachers that offer service in the community. This issue is filled with the history of the development of FPMT’s first teachers complete with photos, stories and trivia. You’ll also find inside a rare, exclusive interview with Osel, the 25-year-old Spanish man recognized as the reincarnation of FPMT’s founder, Lama Yeshe, after he attended a three-day meeting with the FPMT Board of Directors. thing, and do join us on Facebook for daily highlights from Mandala’s rich archive. Many thanks to everyone who completed the Friends of FPMT survey which will help guide the development of benefits such as Mandala Publications and the Online Learning Center in the future. If you have not yet completed the survey, please take a few minutes to do so. We’re here to serve you and your input really matters! All of your responses to the survey can remain confidential and when you have completed the survey, you will be directed to a page where you can obtain a special gift to thank you for taking the time to help us. We invite each FPMT center to organize a Sangha-related activity suited to its local community. The event can be held on International Sangha Day or thereabouts. Please contact Center Services for ideas and to share your ISD events. One of the responsibilities of FPMT centers is to make an annual contribution of approximately US$240 to the Lama Yeshe Sangha Fund (LYSF). International Sangha Day is a perfect day to make your donation if you have not yet done this for 2010. The LYSF is a fund offering financial support to the Sangha of the FPMT who have no other means of financial support and wish to engage in programs of study, retreat or service. By contributing to the fund, you will be enabling more monks and nuns of our organization to receive support and thereby benefit others. Lama Zopa Rinpoche has formally requested Khensur Lobsang Tenzin Rinpoche, who is the current Jangtse Chöje (the title given to the lama who is next in line to be the Gaden Tripa) to teach and give initiations in FPMT centers. Jangtse Chöje Lobsang Tenzin Rinpoche has already been teaching and giving initiations in a few FPMT centers, but now Lama Zopa Rinpoche has formally asked him to teach for FPMT. Please contact Center Services if you would like to invite this wonderful FPMT touring teacher to your center. With great delight we announce that the Spanish Translation Office has translated 126 pages of the FPMT Handbook! The French Translation Office has translated three chapters. Both promise more to come! This is an enormous service for Spanish and French-speaking FPMT staff – so please join International Office in our heartfelt congratulations and thanks to the translation teams. The translated sections are available for your use in the FPMT Affiliates Area of the FPMT website. Several centers have successfully shown Mystic Tibet (the wonderful movie of Rinpoche’s pilgrimage to Tibet in 2002) as a fund-raising event or as an open house event. You will find a useful press packet plus other helpful background information put together to make it even easier for your center to use Mystic Tibet in this way. Please send Claire photos of you reading the FPMT Handbook in a topical setting! Jargalsaikhan (new manager of Dolma Ling Community Centre), Ven. Gyalmo (director of Dolma Ling Nunnery) and Roy Fraser (Director of Golden Light Sutra Center) in Mongolia, reading (and of course, enjoying!) the FPMT Handbook in a Mongolian ger. De-Tong Ling Retreat Centre on Kangaroo Island in South Australia would like to announce that it now has a new website – www.detongling.org – with much information about the center and where retreat application/booking forms can be downloaded. The center’s central purpose has always been to provide facilities for long-term retreat and it has been developed from the very beginning with that purpose in mind. It now has five fully equipped special purpose retreat houses which are set in untouched wilderness, quiet and remote. Rinchen Zangpo Study Group, Mexico becomes Rinchen Zangpo Center!